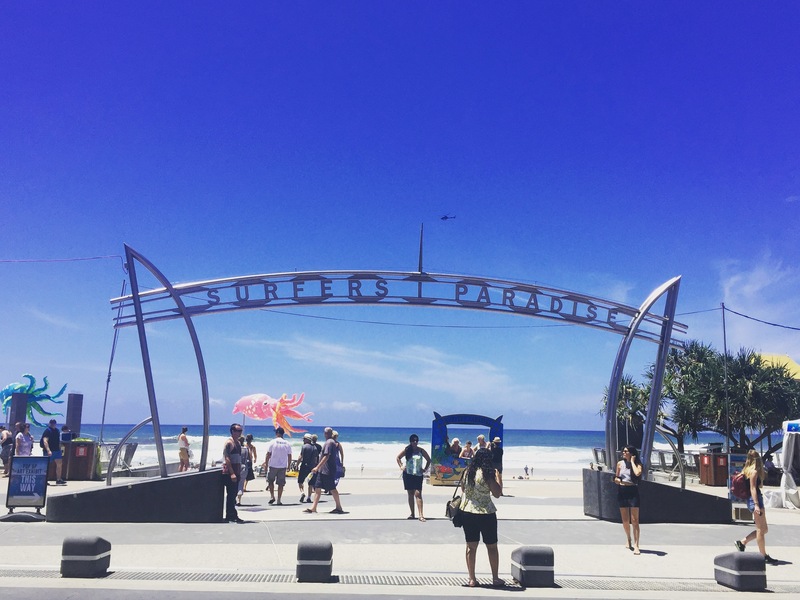 ﻿Our next stop on our East Coast adventure was to Surfers Paradise. We had heard really mixed reviews about the place with some people wanting to come and work here for a few months whilst others didn’t see what the fuss was about. 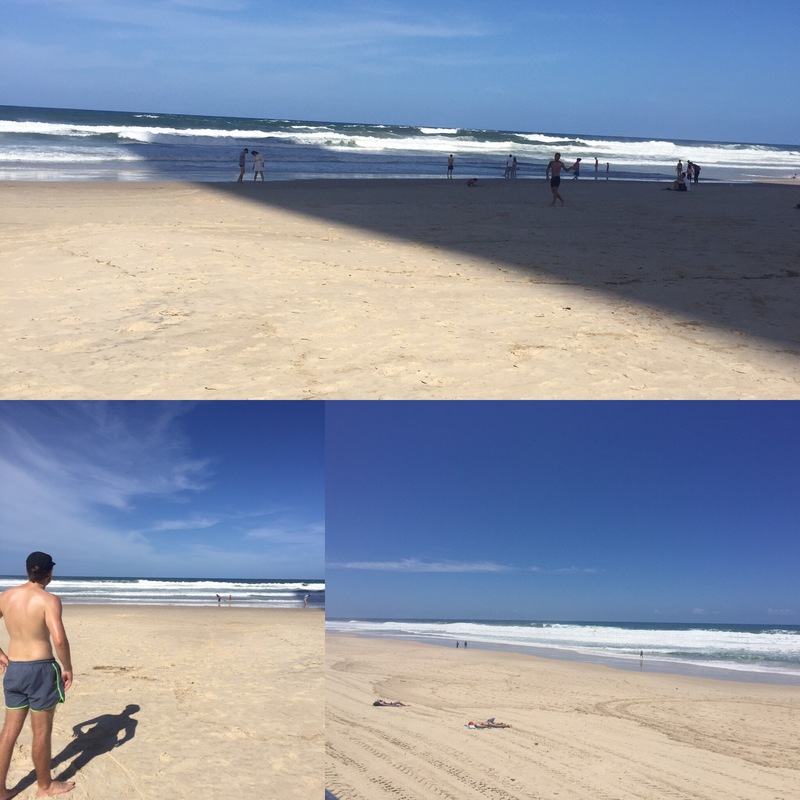 We kept an open mind and on the 10th February 2017 we got an early Greyhound bus from Byron and headed into Queensland to Surfers. Because we were crossing borders it meant gaining an hour despite the journey itself not being very long. We had to wait ages to get picked up by the hostel and then couldn’t check in until 1 so we went for a walk around the city. The main strip along the beach and then into town where the shops were really wasn’t very big and it wasn’t long until we had pretty much seen everything. The beaches are really nice but the waves were huge so we doubted we’d be able to surf whilst we were there. After we checked in we sun-creamed up (it was really hot!) and headed to the beach. One of the skyscrapers that looked onto the beach cast a huge shadow over the beach and into the sea which was something we had never seen before. It was actually quite handy for when you wanted a break from the sun! 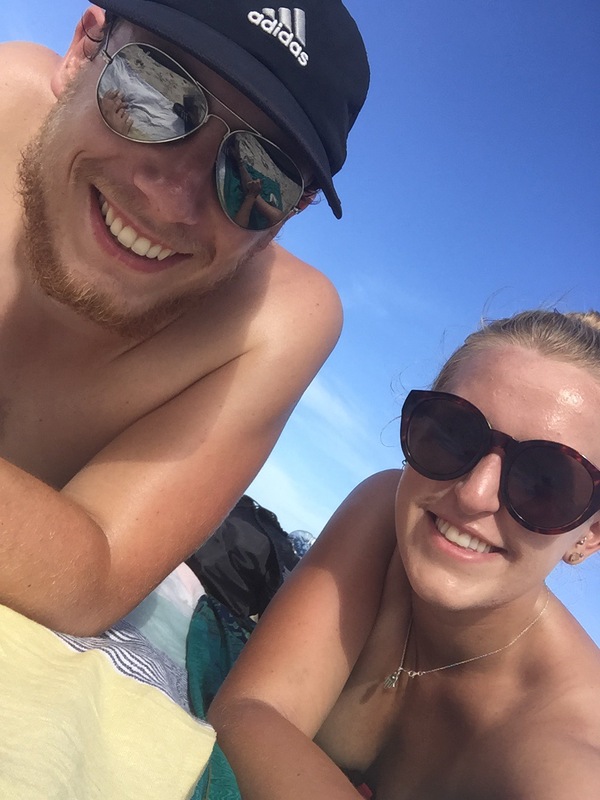 We chilled on the beach for the rest of the day and then had Domino’s for tea (something we ended up doing for all the nights we stayed in Surfers as the hostel kitchen was so small and it was so hot). 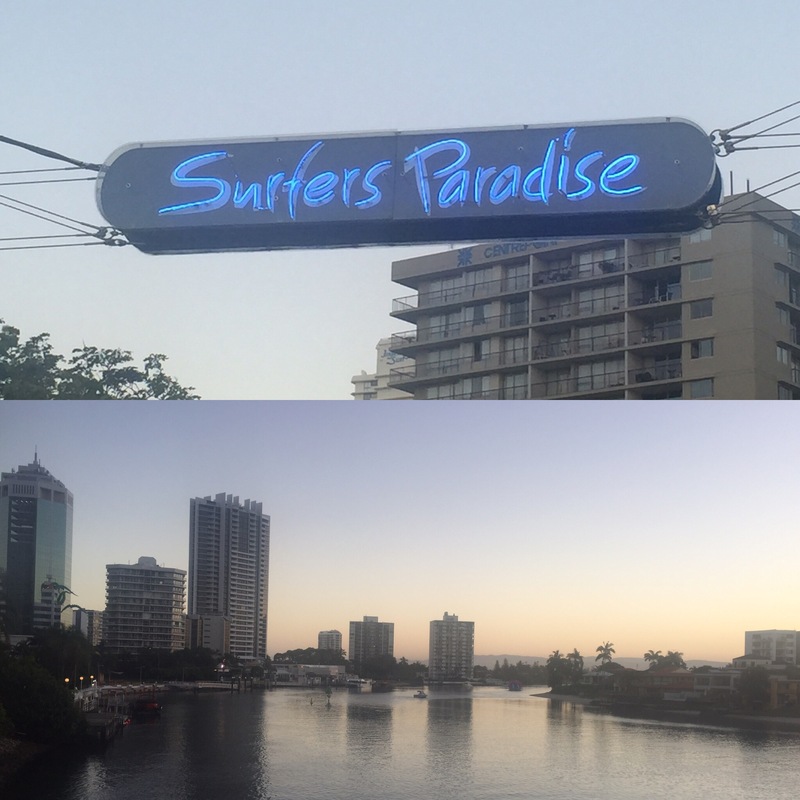 A big part of being in Surfers, a bit like when a lot of people our age visit Newcastle, is for the nightlife. The hostel organise a night out every night and it seems that all of the hostels organise the same events so that all backpackers end up at the same places. On the first night we spent in Surfers, this meant going to a club called Bedroom which cost us $5 including two free drinks (can’t really go wrong with that!). The club itself was quite strange which the bar staff dressed in lingerie and apparently the ladies toilet had a bed in it (who knows why!) 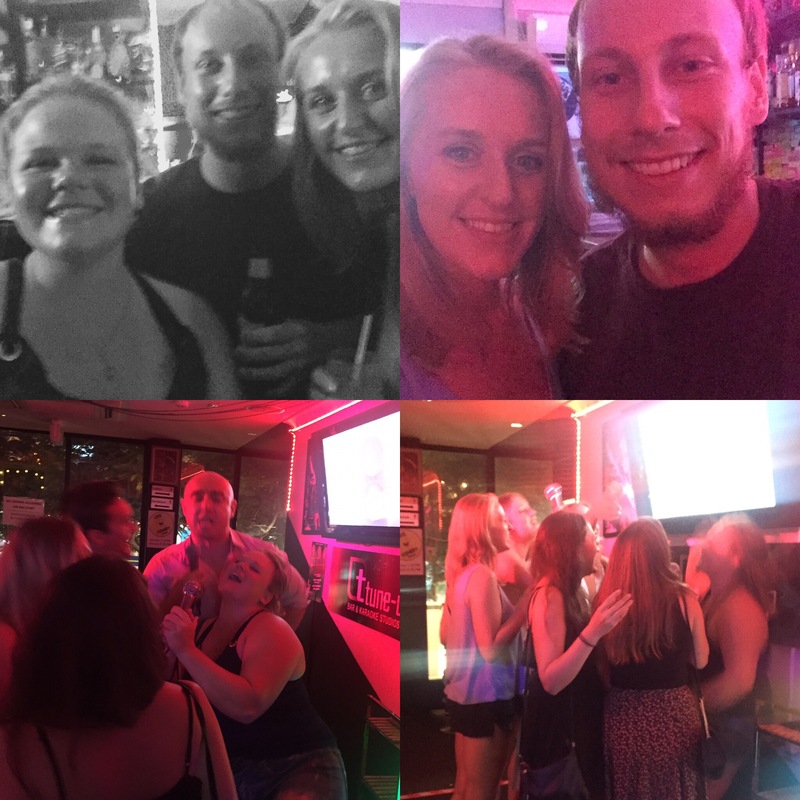 While we were out we bumped into Stacey, Amber and Abbi (from surf camp) and ended up going with them to a karaoke bar where we spent the rest of our night. It wasn’t a late one because we had hired a car for the next day to visit the local national parks. Whilst in Surfers we stayed at a hostel called Budds. We were a bit apprehensive about staying here as we hadn’t heard the best reviews but we actually didn’t find it too bad (although I think that might have been because we were luckily put into a 4 bed dorm instead of an 8 bed). Whilst we were here, the temperatures were in the high 30s and the hostel didn’t have air conditioning or even many windows in the rooms to allow for the air to circulate so it was sweltering in the rooms all the time. This meant you never got a good nights sleep because you were always so hot and even after a shower you’d be sweating again straight away! When we hired a car on Saturday 14th February, we were still pretty tired and also very grateful to get some air-con! 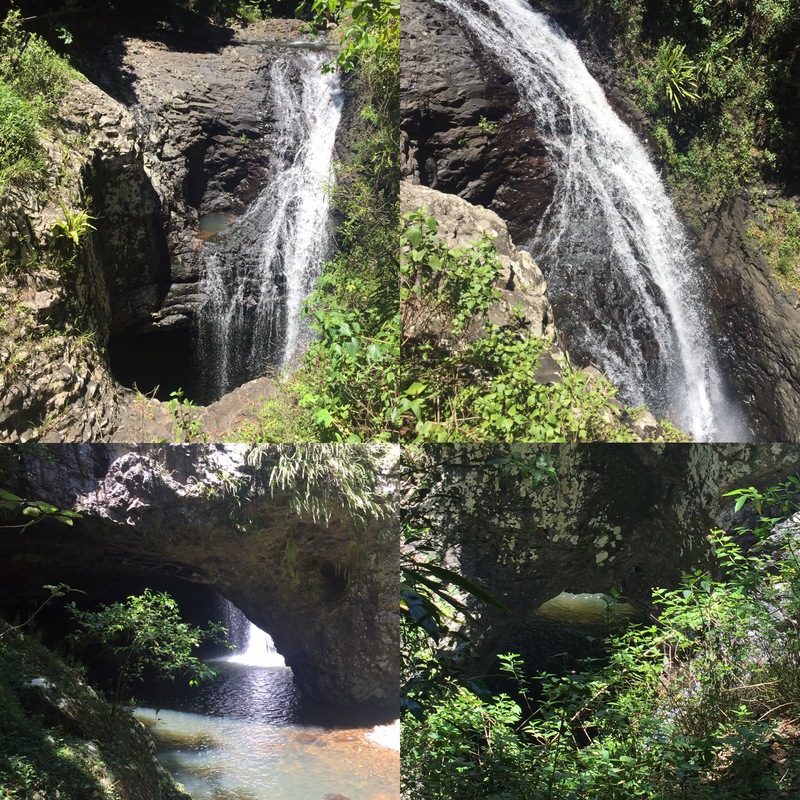 Our first stop was to visit Springbrook National Park and go to see the Natural Bridge. To get to the bridge you took a nice rainforest walk following the creek to a big cave that had a hole in the roof. From one side the hole made it look like the rock formed a bridge but there was also a tree that had fallen down the hole creating a mini bridge in the middle of the waterfall so we are unsure exactly which bridge it’s name comes from. The cave is really pretty with loads of little bent wing bats inside which was really cool and if you were there at night you’d have seen glow worms! 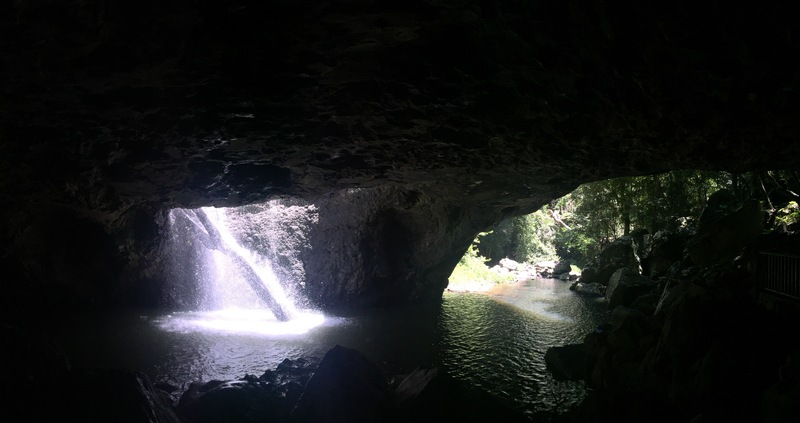 The light that came into the cave made it all the more pretty and we were definitely glad we stopped off to see it. Next was a trip to the ‘Best of All Lookout’ which, considering the name, we had high hopes for. 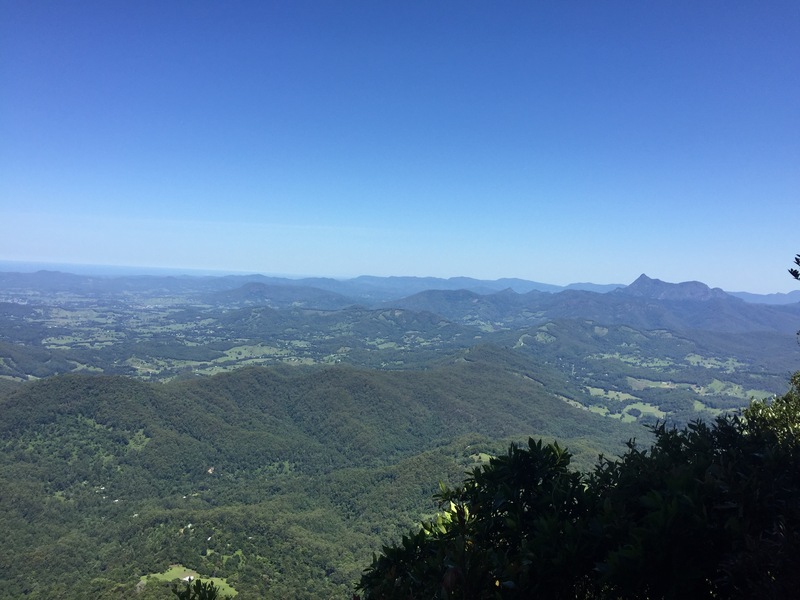 Luckily, we weren’t disappointed and the views we could see showed us the Gondwana Rainforest and, because it was a clear day, you could see all the way to Byron Bay. Looking out onto forests with the sea in the distance was really pretty and it was cool to actually be able to see into another state! The Goomoolahra Lookout was our next stop off and this showed incredible views of the canyon with trees spanning for miles ahead of you. There was also a waterfall called Rainbow Falls that started here but it was hard to see it properly because of the sheer drop that it took into the canyon. Niall commented on how a lot of people don’t realise how green Australia actually is and he is so right! We have been in national parks that have been half the size of some countries and there are so many national parks to visit from Western Australia right across to Queensland. 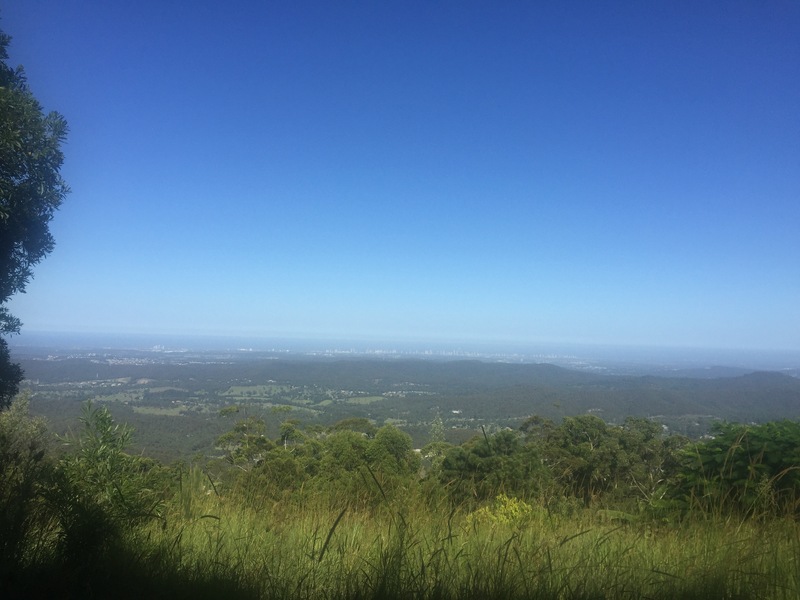 This lookout gave us some great views and you could see all the way to Surfers Paradise. Our favourite lookout view probably came from Canyon Lookout as it showed you 3 waterfalls including Rainbow Falls (where we had been to the top of just before) and Twin Falls. 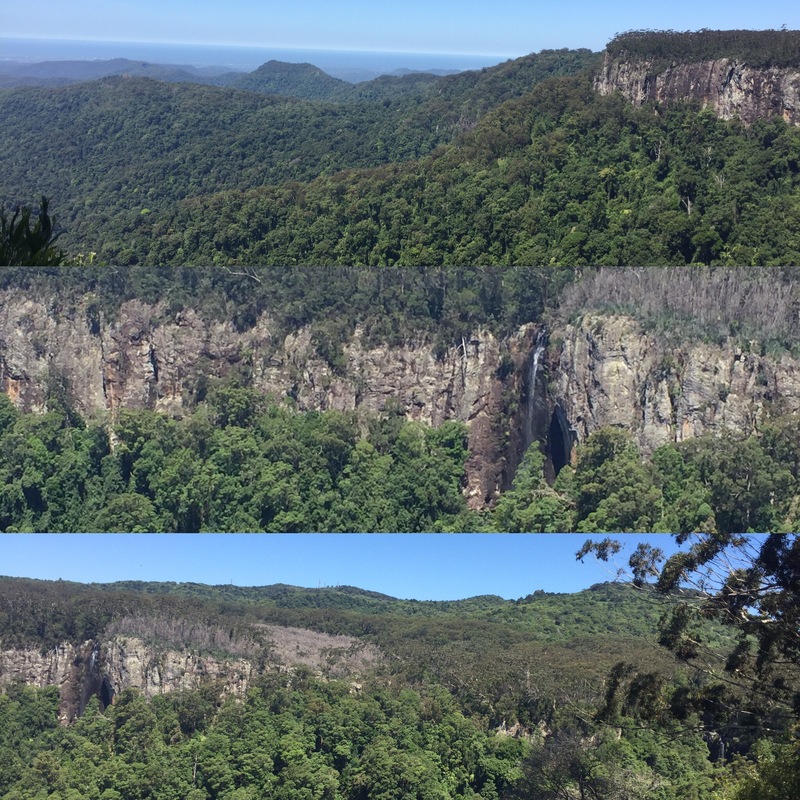 The lookout then showed the rock face of the canyon, all of the trees of the temperate rainforest and then Surfers Paradise in the distance out to sea – this should have been the one named ‘best of all’ for us! 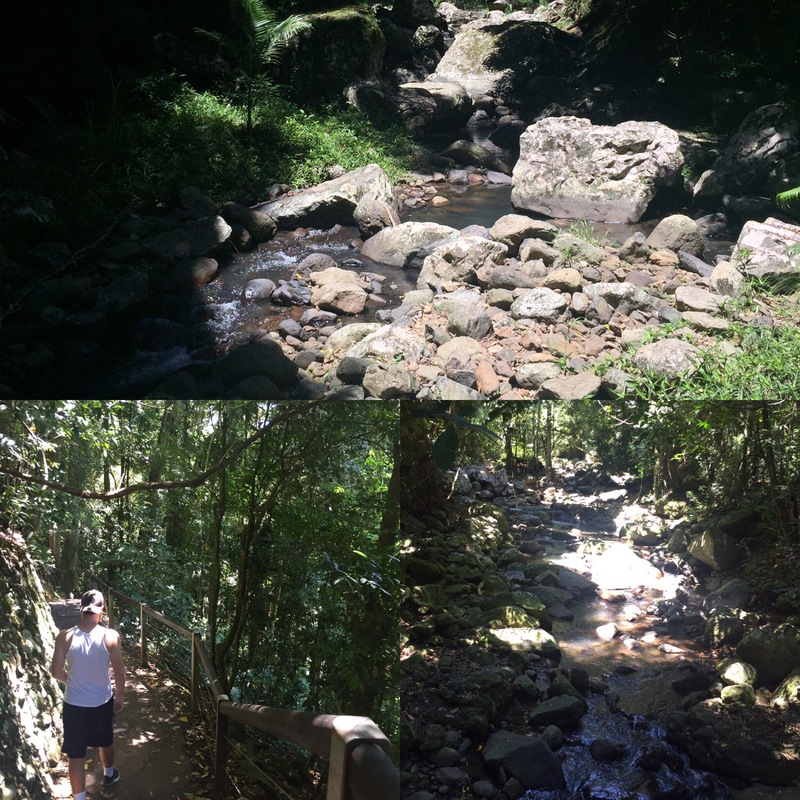 There are a few national parks in the area so we decided to leave Springbrook National Park and head to Tamborine Mountain to see some glow worms. There was a place that had built a man made cave for the glow worms to live and so we decided to give it a shot seeing as we didn’t really want to drive at night meaning seeing glow worms in natural caves weren’t an option. It was really interesting learning about the glow worms and I hadn’t known they were only in Australia and New Zealand. Their light is a lot smaller than I had imagined but it was still cool to have the cave sparkling from loads of tiny little lights. Unfortunately, we had a pretty awkward tour guide which made the whole experience a bit odd and it is very strange to have just made a cave for glow worms as the staff even have to catch bugs and put them into the cave for the glow worms to eat. This isn’t somewhere I’d recommend and it left us feeling a little disappointed that we’d took the time to go. On our way back we stopped at the Gold Coast Lookout which seemed to be a little space between houses on the side of a cliff. 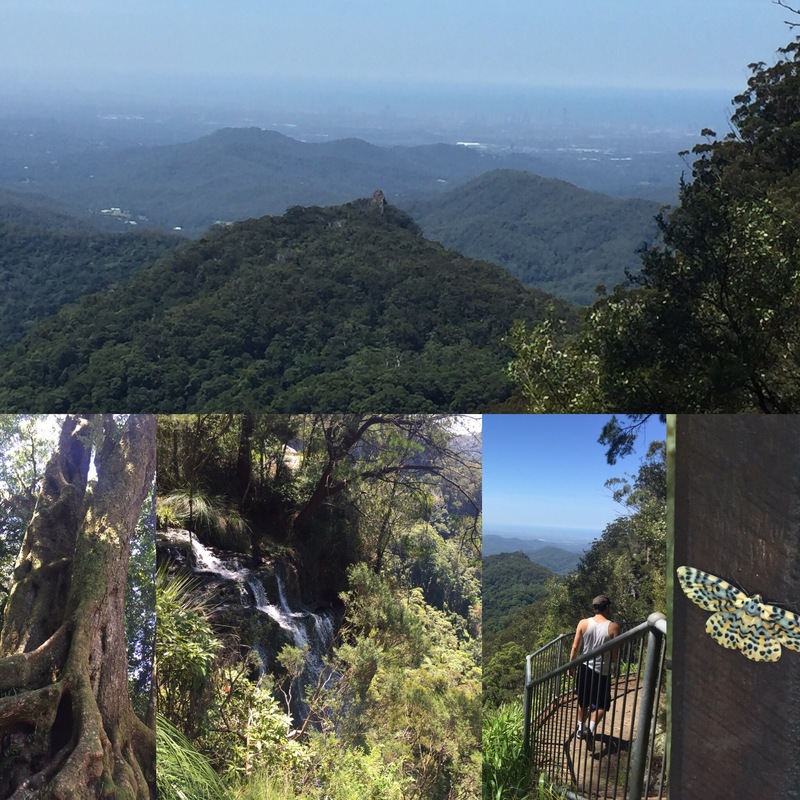 The views were spectacular though as it was a lot closer to the cities so you could see the skyline clearer as well as showing the national parks in front of you – it definitely cheered us up again after the disappointing glow worm caves! That night the hostel (and I think every other hostel in the city) arranged a ‘Big Night Out’ bar crawl which was really good. Before we left we played drinking games with people in the hostel then got on a big coach to a club called Melba. In each club we got free entry and a free drink so it was worth the $25 we paid our hostel and we ended up going to 4 different places. The second of the clubs was called Beer Garden which was massive and had a live band playing. Reps from the hostels would come around when it was time to move on to the next place and the clubs would empty meaning it must be rubbish if you were a local on a night out there seeing as it was a Saturday. The next club was called Underground which played r’n’b music and then the final stop was Cocktail. By this point the group was significantly smaller as people had either stayed in a club they preferred or got too drunk and gone to bed. 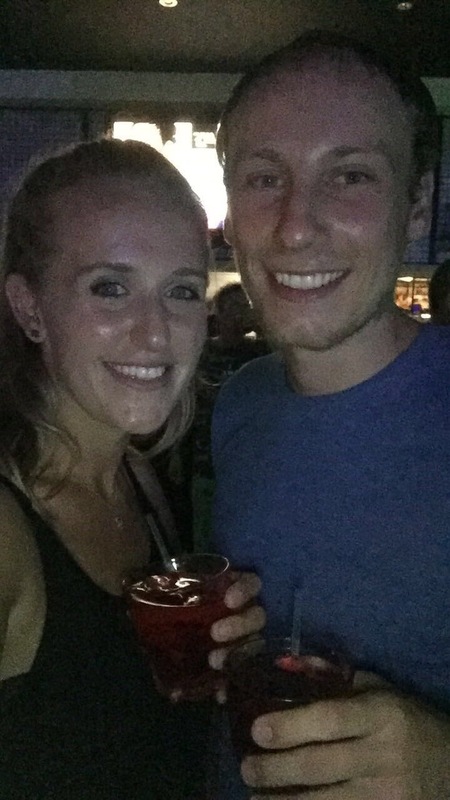 It was a really good idea to get you to try loads of the clubs and bars in Surfers and we had a good night. Our final day we took it very chilled as we were tired from the hot rooms, nights out and busy day at the national park. We spent the day on the beach sunbathing and napping so it was a nice day. That evening we were taught by an American called Lynne and a Canadian called Colton how to play a card game called Ucher. It was good fun but I still don’t think I fully understand how to play it. After what everyone had said about Surfers we didn’t see why people hated it so much. I don’t think either of us would want to stop and work there but the nightlife was fun (perhaps that was only because we were there at a weekend) and the beaches were pretty so we enjoyed our time there. 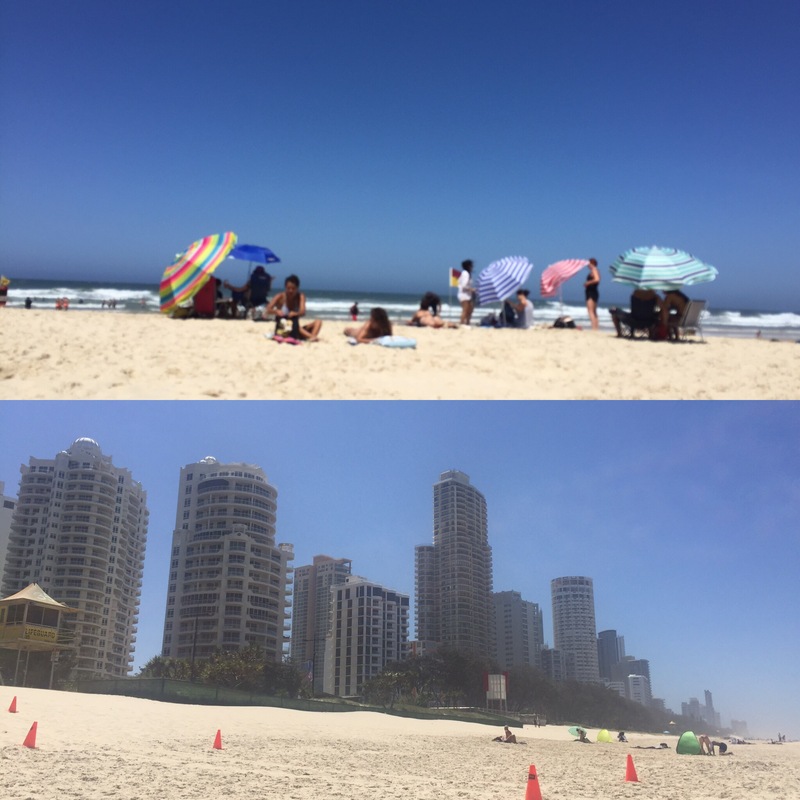 For us, the main issue we had was the lack of air con which is more a focus on the hostel and the heat wave over Surfers Paradise itself.